Vitamin A is a fat-soluble vitamin that has immune-enhancing, antioxidant properties, meaning it can help lower free radical damage (or even oxidative stress). So, what does it really mean if it’s a fat-soluble vitamin? Vitamin A and other fat-soluble vitamins can travel through fat and be stored inside the body or organs such as the liver. Unlike water-soluble vitamins, they can also enter through cells. Vitamin A is also one of those natural therapies that can take on a number of different forms in the human body – 3, to be exact. There’s retinol, retinal, and retinoic acid. Now how do you get vitamin A from your diet? This can be done by eating both plant and animal-derived whole foods, which help provide two different forms of vitamin A. The two main forms of vitamin A obtained from foods are beta-carotene (found in most plant foods, especially the orange, red and yellow ones) and active vitamin A, also referred to as retinol (found in certain animal foods such as eggs and organic meats). How Much Vitamin A Do You Need in a Day? The amount of vitamin A you need would depend on your age, current health and reproductive status (for instance, if you’re a woman who’s either pregnant or breastfeeding). The recommended daily allowance for vitamin A is about 900 micrograms a day for adult men and 700 for adult women. Adults would require about 700 to 900 micrograms of “retinol activity equivalents” (RAE) every day. Sometimes, you’ll see vitamin A content listed as international units (IU), not micrograms RAE. Recommended intake of vitamin A for women who’re pregnant or nursing ranges between 1,200 and 1,300 micrograms every day, since developing fetuses need vitamin A for proper growth. The different types of vitamin A found in the body have various roles and benefits. Some functions include playing a role in maintaining strong bones, gene regulation, clear skin, fetal development, cell differentiation and immune system function. Retinal is the type of vitamin A that’s required for vision. When light starts to shine on the retina, in the human eye, a molecule known as rhodopsin is activated. The activated rhodopsin then sends a signal to the brain that results in improved vision. Vitamin A is also known as an immune-boosting vitamin due to a couple of immune system functions are known to be dependent on sufficient vitamin A intake and antioxidant activity. 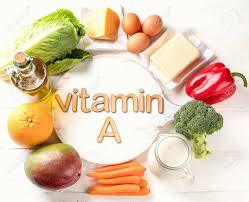 Certain genes involved in immune responses are regulated by vitamin A. Thus, a deficiency in this vitamin can lead to increased infections and an overall weakened immune system. Poor skin health is often the first sight of vitamin A deficiency, this includes dryness, breakouts, infections and irritation. Vitamin A is needed to support all the epithelial (skin) cells both inside and out. This natural homeopathy is also needed to help form glycoproteins, a mixture of sugar and protein, which help the cells bind together forming soft tissues. Due to this function, vitamin A is needed for healing wounds and for skin regrowth.